Top chefs have known for a long time that copper cookware is the best, but why do so many of the culinary experts of the world recommend cooking with copper chef pots and pans? 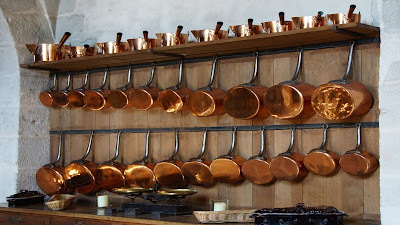 While copper pans are a bit more expensive than regular cookware, they do look amazing hanging on a kitchen wall and, yes, they cook food much better too. The main reason that copper is the best material for pots and pans is that the metal is an excellent conductor of heat. That means better control over the cooking process and it means that the heat is spread more evenly over the pan. With the heat being spread evenly over the pan, there is far less chance of food burning, because you don’t have the problem of a very hot spot at the bottom of the pan, while the rest of the pan is still relatively cool. In fact, copper conducts heat five times more efficiently than iron. Copper is also more resistant to corrosion and it is more hygienic than iron, which probably helps to explain why copper has been used to make cookware for thousands of years. In addition to being better for cooking, copper is more energy efficient too. The heat from the stove is transferred almost immediately, and evenly, through the pot, so there is no hanging around waiting for the pan to heat up before you can start cooking. That means that you use less energy when cooking with copper cookware, which is better for the environment, and better for your purse. If that’s not enough to make you think about buying a copper chef pan, then here’s another reason why copper cookware is the best. Copper is naturally antibacterial, so it’s more hygienic to use in the kitchen than other types of cookware. If you are interested in buying copper cookware, the best type of copper chef pans are those that make use of the age-old benefits of cooking with copper pans and some modern technology too. Many cooper pans are simply coated on the inside with tin, but the more up to date versions of the old fashioned copper pot will have a ceramic coating to make them durable and non-stick, and a stainless steel induction plate to evenly distribute the heat. A modern, ceramic coated copper chef pan will allow you to cook food quickly without the fear of burning the food and, in many cases, you can cook without having to add extra oil, so your food will a lot healthier too. They are also very easy to clean, because they are dishwasher safe. The tough ceramic coating also means that you can use metal utensils without worrying about damaging the non-stick surface. As already mentioned, the best copper chef pans are more expensive than regular cookware, but they will last forever and they will save you a lot of money in the long run. They also look so great that you will want to display your beautiful cookware on your kitchen wall. It just goes to show that, even with all the modern gadgets that have been invented for use in the kitchen, sometimes the traditional methods of cooking are still simply the best!